With solid on-road dynamics, decent fuel efficiency and an accommodating, high-class cabin, the 2012 Ford Explorer is a top pick for a large crossover SUV. Once as ubiquitous as Barney, the purple dinosaur who starred on children's TV, the original Ford Explorer was a staple in the garage of the American family throughout the 1990s. The glory days didn't last, however, as SUV buyers changed their priorities from recreational capability to passenger hauling. So last year the Ford Explorer became a car-based crossover instead of a truck-based SUV, enhancing its well-rounded personality. As such, the 2012 Ford Explorer features a carlike unibody chassis instead of the heavier, truck-based body-on-frame. Refined, carlike driving dynamics are the result, although maximum towing capacity has declined in the bargain. And in another nod to contemporary concerns, the new, turbocharged, "EcoBoost" four-cylinder engine option gives the Explorer best-in-class fuel economy, although at a cost premium over the standard V6. Inside the cabin, the Explorer offers a stylish, well-finished space for up to seven passengers. The second row features seatbelt airbags -- a first for the automotive industry -- that are meant to improve safety for smaller occupants. The third row, though, isn't as roomy as that of some competitors. Perhaps a more appealing selling point will be the abundance of electronic convenience features, including Sync, adaptive cruise control and an automatic parallel-parking system. The MyFord Touch interface found on most models is a neat idea, but we've found it slow to respond and difficult to use. Look for Ford to make software updates to correct some of these issues -- even to cars that have already been built and sold. Overall, though, the 2012 Ford Explorer is very much attuned to what today's large crossover shoppers want. It drives well, returns good fuel economy and keeps the versatility that made people like SUVs in the first place. But rivals including the Dodge Durango and Jeep Grand Cherokee are also recently fully redesigned and bear consideration. Other contenders include the more passenger-friendly Ford Flex, the more engaging Mazda CX-9 and GM's more spacious Buick Enclave/Chevy Traverse/GMC Acadia triplets. They're all quite desirable, and the best choice hinges on your need for space, the driving experience you prefer and the high-tech features that make you comfortable. 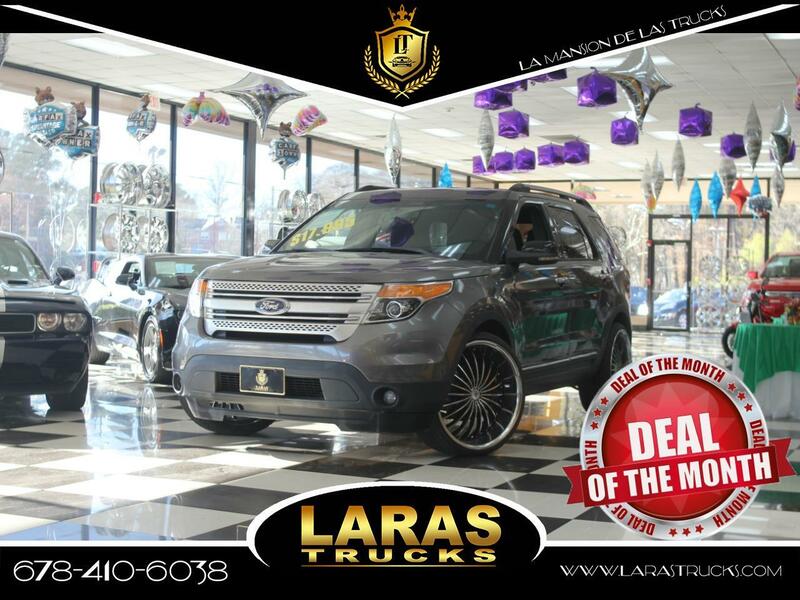 The 2012 Ford Explorer is a large crossover SUV available in base, XLT and Limited trim levels. Standard equipment includes 17-inch steel wheels, privacy glass, integrated blind spot mirrors, roof rails, cruise control, a six-way power driver seat (manual recline), a tilt-and-telescoping steering wheel, MyFord advanced trip computer and a six-speaker sound system with a CD player and an auxiliary audio jack. The XLT adds 18-inch cast-aluminum wheels, automatic headlamps, foglamps, rear parking sensors, upgraded cloth upholstery, a leather-wrapped steering wheel and shift knob, a keyless entry code pad, Sync (voice-activated telephone/entertainment interface) and satellite radio (optional on base). For the Explorer XLT, Ford offers the Rapid Spec options suite that adds a rearview camera, dual-zone automatic climate control, an eight-speaker sound system and the Driver Connect package, which includes an auto-dimming rearview mirror, MyFord Touch electronics controls (includes two configurable displays, two USB ports and audio/video input jacks) and the Sync Services upgrade (includes turn-by-turn directions and traffic reports). The next-level Rapid Spec package includes all of the former plus leather upholstery, heated front seats, an eight-way power driver seat with power-adjustable lumbar, and a six-way power passenger seat. The Limited bundles the XLT's Rapid Spec items with 20-inch wheels, keyless ignition/entry, remote engine start, a 110-volt power outlet and a 12-speaker Sony sound system with HD radio. Two additional Rapid Spec packages include a power liftgate and a navigation system, along with an eight-way power passenger seat, ventilated front seats and a power-folding third-row seat. A safety-focused Rapid Spec suite includes an automatic parallel-parking system, adaptive cruise control, collision warning and brake support, a blind-spot warning system, inflatable seatbelts for second-row outboard passengers, xenon headlamps and automatic wipers. Stand-alone options on the XLT and Limited include a dual-panel sunroof, the blind-spot warning system, a power liftgate, a tow package, second-row captain's chairs (Limited only), a rear-seat entertainment system with dual headrest-mounted displays, and a navigation system that includes real-time traffic, weather and other information. For 2012, the Ford Explorer offers an optional turbocharged four-cylinder engine that promises six-cylinder performance with four-cylinder fuel economy. The 2012 Ford Explorer comes standard with a 3.5-liter V6 that produces 290 horsepower and 255 pound-feet of torque. A six-speed automatic transmission and front-wheel drive are standard. Four-wheel drive (there is no low-range gearing) is optional and includes Ford's Terrain Management System, a selectable four-mode system that optimizes traction electronically for different conditions. Hill descent control and hill start assist are also included. In Edmunds testing, a 4WD Explorer accelerated from zero to 60 mph in 8.3 seconds, an average time for the class. A front-drive V6 Explorer returns an EPA-estimated 18 mpg city/25 mpg highway and 20 mpg combined -- also average for the class. Four-wheel drive lowers this to a still respectable 17/23/19. Properly equipped, a V6 Explorer can tow 5,000 pounds. Optional on all front-wheel-drive trims is the turbocharged, 2.0-liter EcoBoost four-cylinder engine -- also paired with the six-speed auto -- making 240 hp and 270 lb-ft of torque. In Edmunds testing, an EcoBoost Explorer went from zero to 60 mph in 9.1 seconds, which is on the slow side for the class. Fuel economy, however, is a strong 20/28/23. Every 2012 Ford Explorer comes standard with stability and traction control, trailer sway control, front side airbags, side curtain airbags and MyKey, which allows parents to specify limits for vehicle speed and stereo volume. The Explorer's stability control system also includes Ford's Curve Control, which can monitor speed carried into a corner and decelerate if necessary. Optional on the XLT and Limited are a blind-spot warning system (includes cross-traffic alert) and inflatable seatbelts for outboard second-row passengers. The Limited can be equipped with collision warning and brake support. In Edmunds brake testing, a 4WD Explorer came to a stop from 60 mph in 122 feet -- an average distance for the class. The EcoBoost model stopped in 130 feet. In government crash tests, the Explorer received four out of five stars for overall crash protection, with four stars for overall frontal protection and five stars for overall side protection. In Insurance Institute for Highway Safety testing, the Ford Explorer earned a top rating of "Good" for its performance in frontal-offset, side-impact and roof-strength tests. The 2012 Ford Explorer feels rock-solid at freeway speeds, well-damped over broken pavement and very confident when negotiating a corner. The responsive steering demonstrates Ford's skill at tuning an electric power steering system (which improves fuel economy and allows for an automatic parking feature). The 2012 Ford Explorer might not offer a V8 option, but its V6 is quick enough and more efficient. Those who used an older Explorer to tow a large boat may be disappointed, but the V6 can handle the job for most recreational pursuits. And don't be quick to dismiss the idea of a turbo-4 powering this none-too-small SUV. It may not be as quick as the V6, but in practice the EcoBoost engine provides smooth response, more than adequate acceleration and of course better fuel mileage than you'd get with the V6. The Explorer's impressive cabin features excellent build/materials quality within an attractive, upscale design. The dash feels soft to the touch, the switchgear operates with precision (or is touch-operated with the optional MyFord Touch) and the overall look is quite rich. A loaded Explorer is actually just as nice as any Lincoln. Our affections do not carry over to MyFord Touch, however. The touch buttons can be difficult to identify at a glance and too often get pressed accidentally or don't respond properly. As for the touchscreen itself, the small icons on the black background are difficult to see and press when you're concentrating on the road ahead. The redundant steering wheel controls and the LCD screens in the instrument binnacle could also use a bit of fine-tuning. The Explorer's cabin is certainly spacious, but still not quite as roomy as those of the Dodge Durango, Ford Flex and especially the GM triplets. Its 80 cubic feet of maximum cargo space is the smallest of the group and the third row is a bit cramped by comparison, though it does easily accommodate children. The driving position is spot-on for most drivers, though the wide roof pillars and high dash make it seem bigger when trying to fit through tight spaces.